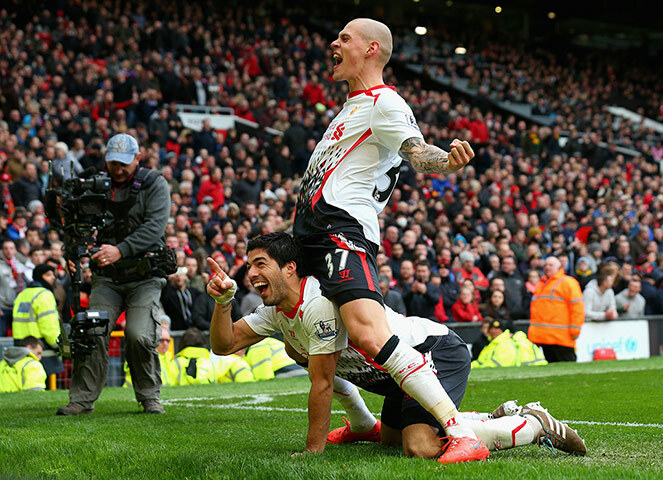 After five years of frustration, Liverpool walked out of Old Trafford on Sunday with their first road win against Manchester United since 2009. The 3-0 beating pushes Liverpool 14 points clear of United in the Premier League table and, more importantly, leaves the Reds just four points back of league-leaders Chelsea (and holding a game in hand). With a spot in next year’s Champions League almost locked up with nine games to go in the season, the question now becomes: can Liverpool claim its first Premier League title in 24 years? Captain Steven Gerrard thinks so. The win was Liverpool’s fifth consecutive in the league – they haven’t lost since their Dec. 29 match with Chelsea – and the club has taken 26 points out of its past 10 games. And much of the credit goes to manager Brendan Rodgers. When Rodgers took over the team before the 2012-13 season, Liverpool was running on fumes, an eighth-place club that wasn’t good enough to challenge the top teams and was living off its past glory. Rodgers came to Anfield preaching patience – something we are far too familiar with here in Cleveland. Rodgers handled the Luis Suárez situation without letting Suárez’ suspension became an issue with the team, has blended Suárez and Daniel Sturridge into the best offensive tandem in the league, has got Gerrard to accept a new role on the pitch, and is currently making all the right moves. It’s amazing how quickly Rodgers has been able to turn things around. Will it be enough to win the title this year? As well as things are going right now that may still be too tall of an order. Liverpool still needs Chelsea and Manchester City, which has two games in hand on the Reds, to stumble and there is no doubt they have to beat both sides when they visit Anfield next month. But with each passing win, it’s getting easier and easier to believe. 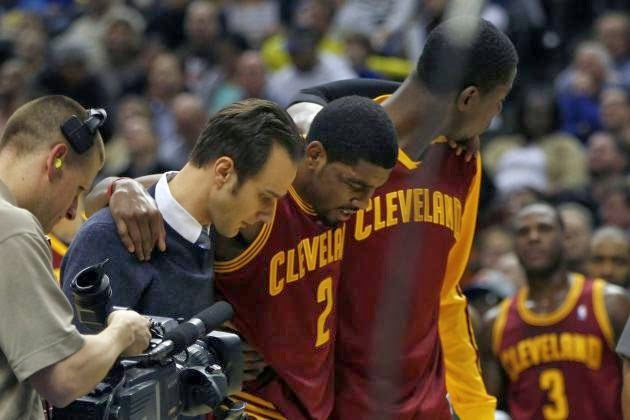 We won’t be seeing Kyrie Irving on the court again for a few weeks. Irving injured his biceps during Sunday night’s loss to the Los Angeles Clippers and luckily it is reportedly only a strained tendon rather than a tear. Still, Irving will be out for a while, which should pretty much kill any lingering hope that the Cavs could make the playoffs. Cleveland currently has 15 games left and are 4.5 games behind Atlanta for the final playoff spot in the Eastern Conference. Even with a fully healthy team, the Cavs would have faced a big challenge to catch the Hawks and, even if they did, would most likely have been looking at a first-round sweep in the playoffs. While the Cavs need to make the playoffs at some point, missing them again this year may not be such a bad thing. This team probably isn’t as bad as it has looked this year, but it may not be all that good, either. If they were to make the playoffs, the feeling among the front office may be that the Cavs are close to being contenders and only a few minor tweaks are needed. The Cavs really need to take a hard look at things this summer and missing out on the playoffs may allow them to take a clearer look at the current situation. Falling further out of the playoff picture will also remove the temptation to rush Irving back. While we’d hate to see Irving’s season end with an injury, especially since he had only missed three games this season, but giving him a few extra days of rest won’t hurt anyone in the long run. In what has to be considered a bit of a surprise, it only took former Browns quarterback Brandon Weeden less than a week to find a new team – and it is one that plays south of the Canadian border. Weeden agreed to a two-year contract on Monday with the Dallas Cowboys and with Kyle Orton not sure he wants to come back to the Cowboys in 2014, Weeden could wind up as the backup to Tony Romo. Which means when Romo gets hurt at the end of the season this fall and the Cowboys are 8-7 and trying to grab the NFC East’s playoff spot on the final weekend of the season, we may be watching Weeden on Sunday Night Football leading the Cowboys offense.